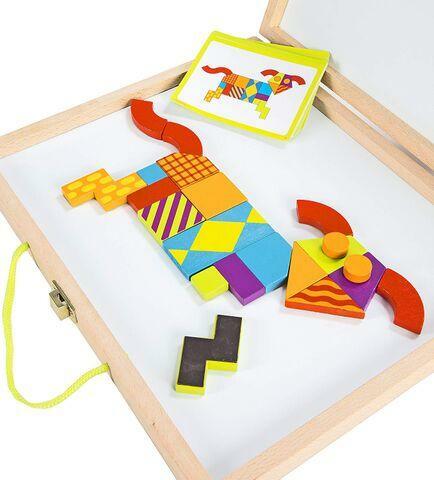 42 brightly-colored wooden magnetic blocks can be arranged on the board to replicate any of the 50 full-color puzzles, such as animals, faces, vehicles, flowers, structures and more! The magnetic creation surface doubles as a dry-erase board. The colorful pattern cards are numbered in order of difficulty, ranging from beginner to expert. As each pattern becomes more challenging, patience and confidence is gained through trial and error. Dimensions: L: 14" x W: 12" x H: 1.5"